A Contrarian Pattern is simply something that is moving in opposition to price. In other words, the indicator is exposing selling while price is still moving up. This is one of the key elements to avoiding getting into a stock and then having it reverse on you and sell down as you take a loss. As an example in the chart below the stock indicator Balance of Power BOP in the bottom chart window exposes whether large lot institutions are buying or selling. It is showing red which means the giant funds are selling or rotating out of this stock, but price is still climbing upward. Many retail traders wonder how this can be. If giant funds are selling or rotating quietly out of a stock, how can price continue upward? What drives price upward is demand AND types of orders. If smaller lots are buying “At Market” which is the most common way for a new investor to buy a stock, then price will continue higher so long as the large lots are careful about not selling too many shares all at once. In this instance the red BOP warns that this is a period of rotation, and that the stock is at risk of a topping formation. There are a couple of days of green BOP but that is far fewer and at the wrong price level for giant funds. They prefer to buy in at a bottom, so this is speculative smaller funds buying at the wrong time. Then a huge high Frequency Trader HFT sell off starts, smaller lots panic, and small funds sell causing BOP to have long red bars. 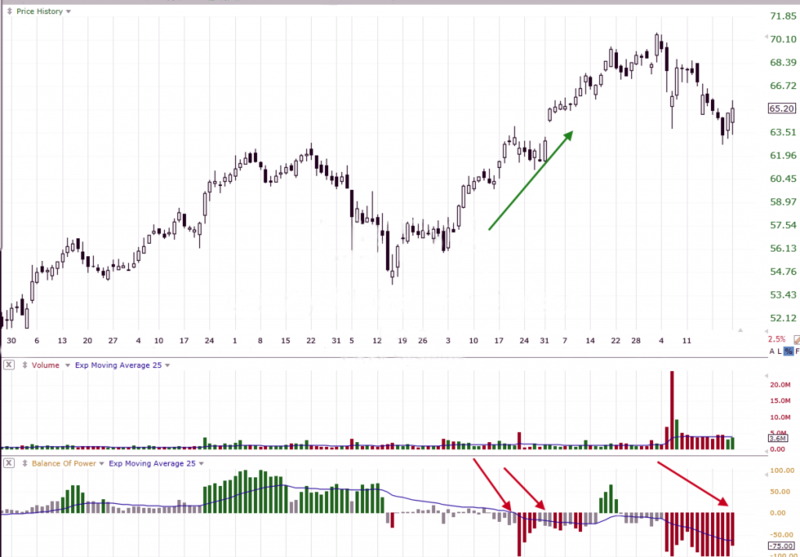 Contrarian Patterns in stock indicators help you see what is going on. Remember there are 9 Market Participants and each has their own agenda, way of buying or selling, order type, capital base, and experience. The more you understand how each group trades, the better you will be at trading.